Traveling south on I-95, Exit US 17 south at Fredericksburg, Follow 70 miles to Saluda Turn Left Highway 33 toward White Stone, Hartfield. Go through Saluda 8 miles look for left exit Highway 3 to White Stone. Turn Left on Highway 3 Grey’s Point will be on your left 5 miles just before you go over a large bridge over the Rappahannock River. Traveling south on US 301, Cross the Potomac River Bridge into Virginia, Go 14 miles to Port Royal and US 17, Take US 17 south, Follow 50 miles to Saluda Turn Left Highway 33 toward White Stone, Hartfield. Go through Saluda 8 miles look for left exit Highway 3 to White Stone. Turn Left on Highway 3 Grey’s Point will be on your left 5 miles just before you go over a large bridge over the Rappahannock River. 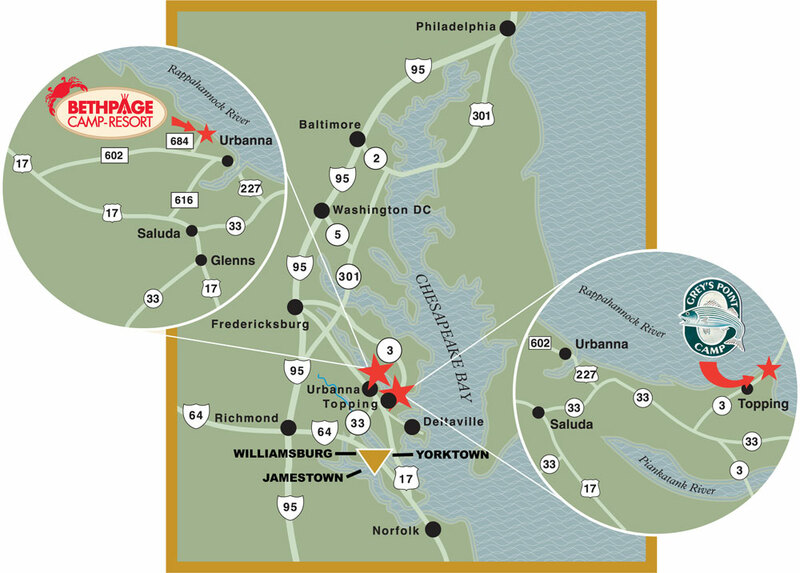 Traveling north on I-95 or I-295, Exit on to I-64 east, Follow I-64 to Exit 220 West Point RT 33, Follow RT 33 through West Point to US 17. Turn Left on US 17 North, Turn Right on RT 33 at Saluda toward White Stone, Hartfield. Go through Saluda 8 miles left exit Highway 3 to White Stone. Turn Left on Highway 3 Grey’s Point will be on your left 5 miles just before you go over a large bridge over the Rappahannock River. Use I-64 to US 17 North, Follow US 17 North across Coleman Bridge 35 miles, through Gloucester, Turn Right on RT 33 at Saluda toward White Stone, Hartfield. Go through Saluda 8 miles left exit Highway 3 to White Stone. Turn Left on Highway 3 Grey’s Point will be on your left 5 miles just before you go over a large bridge over the Rappahannock River.